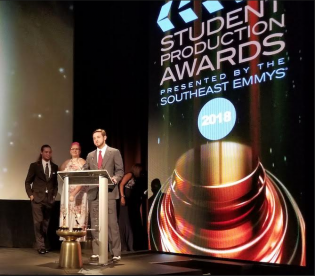 Holden Galatas, Shelby Head and Bradon Holder accept a Student Production EMMY® for Best Sports – Live Events at the 2018 Regional Southeast EMMY® Awards. The Regional Southeast EMMY® chapter of the National Academy of Television Arts and Sciences has recognized Georgia Southern University students with Student Production EMMY® Awards. The Multimedia Development Center (MDC) student production team received an EMMY® for Sports – Live Events, Fairfield vs. Georgia Southern Baseball. Holden Galatas, anchor for this event, also received an individual award in the Talent category. The Southeast Student EMMY® awards encourage the pursuit of excellence in video production and focuses public attention on outstanding achievements produced by high school and college students. The MDC, a division of University Advancement and External Affairs, provides students with media training and hands-on experience that they can then translate into real-world opportunities. Students run cameras, direct, produce and manage over 100 live events each year on ESPN3 and other national televised broadcasts. The Regional Southeast EMMY® Chapter is one of 19 chapters throughout the United States identifying and celebrating television excellence at the local and regional level of The National Academy of Television Arts & Sciences. This chapter represents television professionals from all disciplines of the industry and from each of its markets in Alabama, Georgia, Mississippi, South Carolina and North Carolina.